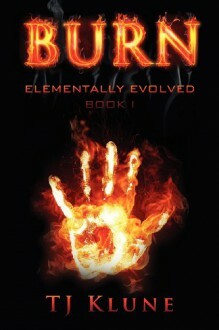 Book One of the Elementally Evolved series Set in a world that closely resembles our own, Burn is a story of redemption and betrayal, of family and sacrifice, which leads to the greatest question of all: how far would you go to save the ones you love? Fifteen years ago, Felix Paracel killed his mother with fire that shot from his hands. Since then, he has hidden from forces bent on exploiting him and his fire and wind Elemental abilities. But Felix's world is about to change, because he is Findo Unum-the Split One-and his coming has been foretold for generations. Though Felix's arrival brings great joy to the Elemental world, it also heralds a coming darkness. No one knows this better than Seven.-Seven, the mysterious man who rescued Felix from that horrible fire years ago and then disappeared; Seven, who has returned to claim what's rightfully his: Felix's heart. But even as Felix begins to trust Seven and his feelings about his place in the world, the darkness reveals itself, bringing consequences no one could have predicted.